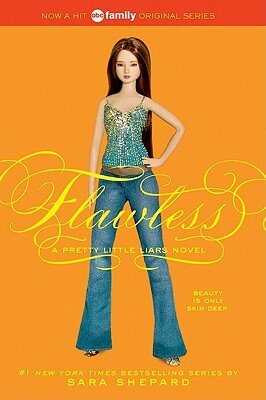 Flawless is the second book in the Pretty Little Liars series. It picks up right where book one left off. Rosewood is shocked when Alison DiLaurentis’s body is discovered in her old backyard. This isn’t the only scandal that the girls are hit with in this book. Aria’s relationship with Ezra ended and now she is into Hanna’s ex-boyfriend, Sean. Also she faces trouble at home when “A” is threatening to reveal a secret that could destroy her family. Spencer is on the outs with her family after her kissing sister’s boyfriend, Wren, who she is still seeing. Emily is questioning her swimming career and her friendship with Mia. Hoping to have her life return to normalcy, she takes a certain someone to the Foxy dance but her date could turn out to be more bad than good. Hanna, so desperately trying to get her ex back, is facing drama at home when her dad comes back into the picture and brings along his so to be wife and stepdaughter. The girls are fighting to keep their secrets untold but who knows how long “A” can be held off. Flawless was a great follow up to Pretty Little Liars. This book is a great mix of drama, rivalry, murder and romance. I would recommend this book to anyone who enjoys the show or has read and enjoyed the first one. It is a perfect book for girls who love drama and suspense. I enjoyed this book almost as much as the first one. Who is “A” is a question that will be on your mind throughout the entire story. Will the girls perfect little lives’ start to unravel and will secrets be revealed? Find out by reading Flawless.